There IS comfortable Laser Treatment! Dr. Marcy Smurthwaite is Certified with the American Society of Laser Therapy. She was the first doctor in the Tampa Bay area to utilize non-invasive cold laser technology, a Low-Level Laser Therapy (LLLT) treatment which shows remarkable results in treating Carpal Tunnel Syndrome, muscle and joint pain, stiffness, muscle spasm, arthritis and more. The Cold Laser is a non-thermal (no heat) laser capable of penetrating deep into tissue. The tissue’s reaction produces an increase in cellular metabolism, which expedites cell repair. Cold Laser Treatment is meant to increase blood flow, decongest tissue, promote healing and decrease pain. Injuries result in two types of pain. The first is actual traumatic pain from the injury itself, and the other pain is the resulting swelling. Low-Level Laser Therapy provides relief in different ways. One of the main ways is that the laser light helps absorb the excess swelling. Medical researchers began using Low-Level Laser Therapy in the 1960’s with low-powered laser beams that produced non-thermal effects on human tissue. The fact that it works has been substantiated by decades of responsible research. 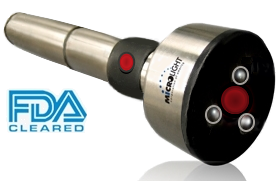 Cold Laser Therapy has FDA clearance. If you or anyone you know is suffering from the above, have them call our office. We are here to help! Call today for effective, gentle chiropractic care! If you'd like to receive our newsletter, sign up here!